In November, Firefox OS launched in Hungary, Serbia, Montenegro and Greece. Earlier this month we launched in Italy. In 2014, we launch in new locales with new operators, with new devices in new form factors. We anticipate more powerful cross-platform tools in 2014, and closer integration with PhoneGap and Firefox Developer Tools. It is the best of times for first-mover advantage. Here’s a look at just a few successful ports. We spoke with skilled HTML5 app developers who’ve participated in “app port” programs and workshops and asked them to describe their Firefox app porting experience. It is extremely easy to build/port apps for Firefox OS. It is great that we can use web tools and frameworks to create native apps for Firefox OS. I recommend that other developers start developing Firefox Apps; it is almost effortless and a great experience. The only challenge I had was finding out how to build the package. It was amazing when I realized that building for Firefox OS was as easy as creating a zip with the app files and manifest. It was really easy. That’s why I would sign the claim “Write Elsewhere, Run on Firefox OS.” I think it took about two evenings with night #1 getting the app to run and night #2 doing some fine-tuning for display size of the simulator and Keon. Afterwards another evening for app icon and deployment to the Marketplace ;-) . I would recommend that developers give it a try to see how easy it really is. I think Mozilla.org is doing a great job and your support for developers is excellent. I already made a short presentation about how to create FirefoxOS Apps as a documentation of my experiences. You can see it here: A Firefox OS app in five minutes (in English). There’s also a blog post called App Entwicklung fur den Feuerfuchs that documents my experience in German. 1. I use OSX 10.9 Mavericks, and the Simulator crashed with the old plugin and ran more stably with Firefox 1.26b and app-manager. 2. The need to have a subdomain per app — it seems there’s an open issue with this. 3. Data types in JSON Manifest (I tried “fullscreen”: true instead of “fullscreen”: “true”). My fault: Solved by sticking to the documentation. 4. I have the feeling that the icon sizes are different in the documentation to the sizes really needed for the Marketplace. Also, it’s not sensible to offer a Photoshop-Template for a 60×60 pixel Icon when you need much bigger files elsewhere (256×256 for the store I think). It would be better if you provided a template for 1024 and the user then shrank the images afterwards. 5. Suggestion: The correlation between navigator.mozApp.checkInstalled() and .install() could be explained more comprehensively. It was easy. I took a few hours. You are doing good work with this platform. I had problems with manifest.webapp, I think that I missed having more documentation about this type of file. The whole process of porting Captain Rogers for the Firefox OS platform took me only two weeks of development with an additional two weeks of testing and bug-fixing. In the core concept the game was supposed to be simple so I could focus on the process of polishing it for Firefox OS devices and publishing it in the Firefox Marketplace. For optimizing the code I recommend this handy article by Louis Stowasser and Harald Kirschner — it was very helpful for me. Also, the Web Audio API is still a big problem on mobile, but it works perfectly in Captain Rogers, launched on the Firefox OS phone. The main message is simple: if you’re building HTML5 games for Firefox OS, you’re building them for the Open Web. Firefox OS is the hardware platform that the Web needs and in the long run everybody will benefit from it, as the standards and APIs are battle-tested directly on the actual devices by millions of people. If you want to know more about HTML5 game development I can recommend my two creations: my Preparing for Firefox OS article and HTML5 Gamedev Starter list. You should also read this great introduction by Austin Hallock. The community is very helpful, so if you have any problems or issues, check out the HTML5GameDevs forums for help and you will definitely receive it. It’s a great time for HTML5 game development, so jump in and have fun!. Extract all the business logic for the App (which handles the schedules, movies, listings, etc.) to its own Git repository/module. Then we reuse everything on Titanium and Firefox OS, using native user experience for all the three platforms we now accept. Another issue we had was to actually implement an OAuth client on our phone in a good way. However Jason Weathersby pointed out good resources on that matter for us. Firefox OS and the environment (debug, etc) is easy for a regular web developer, so we didn’t need extra knowledge for making real mobile apps. Use Firefox OS Building Blocks for UI. It’s easy to get a native UI experience with no fuzz. Firefox OS at the Mozilla MDN will be your best friend :-). GitHub has some good projects to learn from, so create an account (if you still don’t have one) and look for demo projects. PhoneGap support is coming for Firefox OS, and in preparation I wanted to become familiar with the Firefox OS development environment and platform ecosystem. So… I ported the Fresh Food Finder, minus the specific PhoneGap API calls. The best part (and this really shows the power of web-standards based development) is that I was able to take the existing PhoneGap codebase, turn it into a Firefox OS app AND submit it to the Firefox Marketplace in under 24 hours! Picross was installed and running on FxOS within minutes of getting my hands on a device. I did have to make some touch API tweaks, but that just meant some quick reading. My favorite quote was “You’re not porting to FirefoxOS, you’re porting to the Web!” Also, Firefox OS (and Firefox browser) Canvas support is sensational. My next game will use Canvas, for sure. In my case, the “porting” path was really simple. My game already ran in a browser, and it had originally been designed to run on the Palm Pre, a device with the exact same resolution as the lowest-end FirefoxOS phone. But the concept of installing an app involves nothing more than visiting a website: that’s what really made it painless, and that is what’s really unique about FirefoxOS. It has an “official” app marketplace, but unlike every other smartphone ever made, it doesn’t _need_ one! As a user, this is liberating. I can install any web app, from any site I want. As a developer, the story’s even better. I don’t even need Mozilla’s permission to publish an app on this platform. I don’t need to put my device into a special developer mode, or buy any toolkit, or build on any specific platform. If I can put up a website, I’m good to go. Even though I just called it “unnecessary”, the Firefox Marketplace has given me nothing but good experiences. I don’t need to bundle up, sign, and upload any package — I just enter a URL and type up some descriptive blurbs. Review times have always been short, and are even quicker now than when I started. When I submitted Halloween Artist, it was approved almost immediately, and the reviewer suggested that I write up a blog entry for Mozilla Hacks about how I’d put it together. This is both a traditional “marketplace” with the featured apps etc, and a community of geeks celebrating interesting code and novel ideas. That is absolutely the world I want my apps to live in. Before I went to the Mozilla workshop, I was considering what approach to take for an action/adventure game that I’m still working on. I was torn between writing some C OpenGL code, waiting for the not-yet-released-at-the-time SDL 2.0, or, as a longshot, doing at least some prototyping in HTML5 canvas. After learning that Canvas operations on a FirefoxOS phone basically go right to the framebuffer, and after trying some experiments and seeing for myself the insane performance I could get out of these cheap little ARM devices, I knew I’d be ditching C for the project and writing the game as a web app. I’d highly recommend investigating Canvas for your next game, even if you’ve mostly done Flash or SDL etc. before. It took us about a week to port everything over from Chrome to Firefox OS. One challenge we faced when creating Reditr for Firefox OS was the content security policy (CSP). One of the great things about web applications for users is that they can see an entire overview of the permissions that a given app requires. For developers though, it can take some time to learn how to create a content security policy. For Reditr, it took us several days of trial and error to learn how the security policy effected our app. Make sure you understand how your app deals with the content security policy. Check to see if the APIs you use have oAuth support since this can help remedy CSP issues. No real challenges here that I can recall of. Everything was almost a piece of cake! My recommendation to fellow devs would be them to port their HTML5 apps to Firefox OS as soon as possible! Porting a Web app has never been easier. Firefox OS is a promising OS that shows the great power of Web Development! The game has always been a web project: the initial development, from scratch, took nearly 1 month. Porting it to be a Firefox application only took a couple of days, in order to make the manifests and icons. Performance tweaking has been a complex task and took nearly as much time as the rest of development. Squarez is the first game I have ever written and it is the first time I have used Emscripten, that was the first challenge. Writing a web application is not really a challenge any more, because good quality documentation is available everywhere. Second challenge was tweaking performance, once I had received the Geeksphone Keon, I saw that the game was so slow that it was almost unplayable. I have used performance tools from native compiled code and both desktop Firefox and Chromium to find the bottlenecks. My recommendation for other developers is to choose technologies they like; I wanted structured and statically typed code, so Emscripten/C++ was a great solution. I would also discourage creating an application that only works in Firefox OS, but take advantage of standards to make it available to any browser and have Web APIs used to enhance the application. If you want to also include a link to the code repository, it is available at squarez.git. Everything is GPLv3+, fork it if you want. It took one day to do the bulk of the work, and another day for final details, including registration in Marketplace. Later, I added payment receipt checking which took me the best part of a day since it needs to be well tested. But this effort could be reused readily for another app (Touch 11i). In general, porting was very easy. I put it to work in one day. The biggest problem was the viewport: that works differently in other platforms (all Webkit-based). For Firefox, I had to use a CSS transform-based approach to fit the calculator in screen. Touch 12i is an HTML5 app that runs on Windows Phones and it works in the same way for Android and iOS too: a “shell” of native code with a Web component that cradles the main program. Currently the Firefox version is the only one that is “purely” HTML5. (I used to have a pure Web-based version for iOS as well, but this model has been toned down for iOS.) I’ve written a detailed blog post called Playing With Firefox OS, about my experience participating in the Phones for App Ports program. And that’s a wrap. Thanks for reading this far. If you’re a Firefox OS App porter, a web developer or simply a curious reader, we’d love to hear from you. Leave a comment or send us a note at appsdev@mozilla.com. Author’s note: We did quite a bit of emailing and investigating to collect testimonials from the app developers featured above. Along the way we heard from some other app developers, whose comments didn’t reach us in time to make the deadline for the post. Shreyas Sood wrote NewsWala with a custom wrapper. CHALLENGES: One of the challenges I faced was finding documentation, tutorials and resources on the web (specially regarding CORS and XML and using the firefox UI templates). Some of the documentation was still unfinished and confusing at times (Maybe just because I’m not a professional developer). Yet an excellent developer community over the web and my firefox contact helped me get all my problems rectified and my queries answered. TIME: I didn’t work continuously, due to my exams so it took me about 2 weeks. I think if I would have worked continuously, possibly it would have taken me a few days. It’s an amazing platform specially because it’s open. Now, I see the power of HTML and how even HTML can be used to create awesome native apps. I loved how my questions were answered either by someone from the Mozilla team or developers on stack overflow. My developing experience for it was great fun and I look forward to where the platform is headed! Denis Golovachev wrote Find my Car as a pure HTML5 app. No wrappers. It’s my second App for Firefox OS. Both are opensource HTML5 applications with same technologies on the background: Grunt, AngularJS, ParallaxJS, Brick, UnderscoreJS. CHALLENGES: Releasing an App for a platform I’ve never worked with before. I started to develop this application when I had no Firefox OS phone. I could test my App on emulator and on Android Firefox Browser. But that was not enough. Three of my first attempts to release it failed with “Application opens with a black screen” reason. I was not able to reproduce this behavior without a real phone. I spent three weeks, searching for this bug. Finally, I found a person with a Firefox phone and he helped me to find it. The reason was “CSP”. Angular “ng-csp” directive helped to make a step forward. HTML5 API. “Find My Car” uses Geolocation and Device Orientation API. But, this API is not standard and I was frightened that emulator behavior is different from the real device. That was the first thing I’ve tested, when I finally received a Developer phone. And, hooray, everything was fine. Comment I heard from Christian Heilmann probably describes it best. If you know how to build a web site you can build Firefox OS app. This comment is 95% accurate in my opinion. I developed my game as a HTML5 game. It was originaly developed for browsers, both desktop and mobile. Since I had only couple of hours a week, I am a working dad, it took me about a month to finish initial version of the game. Once the game was finished and tested in various browsers with canvas support it took me one day to read a documentation, create a manifest file and enable installation from my web site. Documentation was not completely clear to me, later I figured out that in order to test in simulator manifest needs to be called manifest.webapp. After getting the game to install from my site it took additonal day to create icons, screen shoots and to put it into marketplace. My game might not be that great but I have a game that can be installed on my Ubuntu desktop, my wifes Windows desktop, that is installed on my Nexus 4 and on my brothers Alcatel One Touch Fire. That is four devices and four operating system with out any additional work. I am currently working on a new game and a localised serbian app with my friend. I am amazed how easy is to develop apps for multiple devices thanks to Mozilla guys. I plan to port all apps to Chrome web store soon. The installations and manifest are similar and it does not seem like to much aditional work will be needed. I hope that in a near future manifest and installation api’s will be standardized so users can install the same app regardless of what browser they use. That way we would be able to write a web app and users with any modern browsers can install them and use them regardless of their device or operationg systems. I am really impressed by what you accomplised. I thought this is a great idea but I never expected it to work so good so early. Keep up with good work. Thanks for sharing, and for doing the good thing! Best of luck! Thank you for collecting these testimonials, they are very informative and inspiring. I am interested in the reverse path as well, i.e. 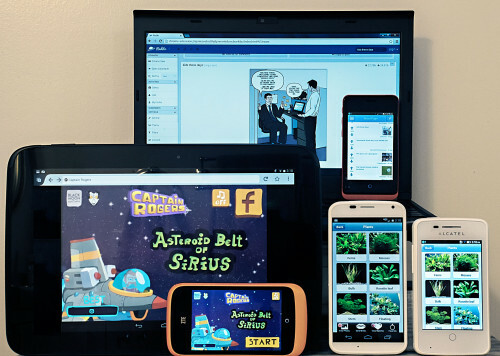 to write apps using FirefoxOS developer tools and directly build for all other mobile platforms. I think this is very important for developers who are starting to build new mobile web apps and looking for proper tools. One path that comes to mind is writing the app for FirefoxOS and then build it to other platforms using cordova. However, FirefoxOS APIs dont always map to cordova APIs. I know that there is work being done inside cordova to add FirefoxOS as another platform. But is anyone out there working on a reverse solution to bridge FirefoxOS APIs and Cordova? Are there any other reasonable paths for porting FirefoxOS apps to other platforms? I guess, at the moment, that if you want to use a Cordova/PhoneGap solution to target more platforms, it would be recommended to build it using their API calls instead of Firefox OS-specific ones. Since they will then support Firefox OS as one of their target platforms, it should work well on Firefox OS as well. Thanks for the information.. I was looking to dig into firefox os API, but sine you are recommending the phonegap / cordova so this seems to bit easy to develop apps..